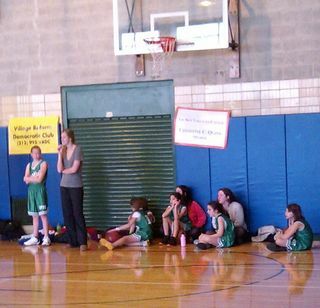 My 16 year old daughter (in the orange sweater with a player on her lap in the photo) and her friend got up at 9:15am this morning, about three hours earlier than they'd ordinarily get up on a saturday morning, and headed over to the local public school to be assistant coaches in the Greenwich Village girls basketball league. Both of my girls played in this league in their middle school years and then assistant coached in it during their high school years. The skills and experience they developed playing in this league allowed them to be leaders and top players on their high school team. Earlier this week, when I showed up at my daughter's high school game, I saw one of the younger girls on her Greenwich Village team in the stands cheering her on. As I sat there this morning watching these little girls play basketball, I was thinking about role models. I talked a bit about role models in the Fast Company interview I did last month. We can back first-time entrepreneurs and have mentors and role models for them and we have those role models in their second, third, and fourth startups and that's the magic–that creates a sustainable startup economy that Silicon Valley has had for four decades now. Role models are so important. When my girls were young, they had high school players who were their assistant coaches to look up to. They had women head coaches who had played college ball. They had Becky Hammon who was the point guard on the NY Liberty to go root for. They wanted to be them, they listened to them, copied them, and got a lot better as a result. The same thing plays out in startup land. The young entrepreneurs who are starting companies for the first time are best served by seeking out and getting experienced serial entrepreneurs as angel investors, board members, and mentors. We encourage all of the first time entrepreneurs we work with to do this. And the serial entrepreneurs who work with young founders get something out of it too (in addition to equity). It is a truism that the best way to learn is to teach. I know a bunch of seasoned entrepreneurs who love working with young first time entrepreneurs because they learn quite a bit from it. Matt Blumberg, founder and CEO of Return Path, wrote a great post about this last summer. One of the best things about the startup programs like Y Combinator, Seedcamp, Techstars, and many others is that they provide a vehicle for young entrepreneurs to connect to experienced entrepreneurs. Mentoring is a big part of these programs. But not every young entrepreneur gets to participate in one of these programs. I'd like to see more vehicles emerge, not just here in NYC but in every startup community, to connect first time entrepreneurs with mentors and role models. Everyone would benefit from more role models, mentoring, and coaching.